The Pittsburgh Steelers had missed the postseason in 1980 after eight straight appearances that included four Super Bowl championships and were looking to rebound as they opened the 1981 season on September 6 at home against the Kansas City Chiefs. For Head Coach Chuck Noll’s team, the roster might have been aging, but the nucleus was still strong and included such mainstays as QB Terry Bradshaw, RB Franco Harris, wide receivers Lynn Swann and John Stallworth, DT “Mean Joe” Greene, linebackers Jack Lambert and Jack Ham, CB Mel Blount, and SS Donnie Shell. There were also promising younger players in RB Greg Hawthorne, WR Jim Smith, and CB Dwayne Woodruff. 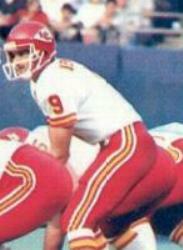 The Chiefs, under Head Coach Marv Levy, were coming off an 8-8 record in ’80, the club’s best since 1973. The offense tended to be dull and highly conservative, while the defense featured All-Pro NT Art Still, LB Gary Spani, and Pro Bowl FS Gary Barbaro. It was not a promising situation starting off the new season in Pittsburgh, however, for there was a lot of inexperience on defense and the offense was without starting QB Steve Fuller, who had suffered a knee injury, putting backup Bill Kenney (pictured above) behind center. With 53,305 fans in attendance at Three Rivers Stadium, the Steelers scored first when Bradshaw connected with Swann for an 18-yard touchdown, but rookie PK David Trout missed the extra point attempt. Kansas City came back with a 48-yard pass play from Kenney to WR Henry Marshall, and Nick Lowery’s PAT was successful to put the visitors ahead by 7-6. Lowery extended the lead with a 35-yard field goal later in the opening period. In the second quarter, Pittsburgh moved back in front thanks to a seven-yard touchdown run by Franco Harris, but once again Trout failed to add the extra point. Harris added another TD from a yard out and this time the PAT was added. Lowery kicked a 40-yard field goal and the teams went into halftime with the Steelers leading by 19-13. Kansas City retook the lead in the third quarter on another long pass play, this time with Kenney throwing to WR Carlos Carson for 53 yards. Lowery’s extra point made the score 20-19. The Steelers again came back as Greg Hawthorne scored from a yard out and Trout successfully converted the PAT. But sloppy play was catching up to the Steelers, and a Bradshaw fumble led to more points for Kansas City, this time a 42-yard field goal by Lowery that cut the home team’s margin to 26-23. In the fourth quarter, a fumble by Harris again helped the visitors as the Chiefs drove 38 yards and RB Ted McKnight ran for a three-yard touchdown that put KC ahead by 30-26. But once again Pittsburgh came back when Bradshaw passed to Jim Smith for a 41-yard touchdown to put the Steelers in front at 33-30 with 7:12 to go. The Chiefs were forced to punt following their next possession and it looked bad for the visitors when the Steelers advanced to the KC 28. Kansas City was out of timeouts and Pittsburgh had a first down heading toward the two-minute warning. But as Bradshaw took the snap and was preparing to hand off, he was hit hard by blitzing LB Frank Manumaleuga and lost the ball. LB Thomas Howard picked up Bradshaw’s fumble on the run and charged 65 yards for a touchdown to put the Chiefs in the lead with 1:59 remaining to play, utterly silencing a crowd that had been thrilled by the go-ahead scoring pass a few minutes before and was sensing victory. Pittsburgh still had a chance, but Gary Barbaro (pictured at left) intercepted a Bradshaw pass to end the threat. Kansas City came away with a 37-33 upset win. The big story was the seven turnovers by the Steelers, who fumbled eight times, losing five of them (including the game-decider), and gave up two interceptions. Together with the two missed extra points, it was an uncharacteristically mistake-filled performance. Pittsburgh outgained the Chiefs (408 yards to 353) and had more first downs (29 to 17). But Kansas City turned the ball over just twice, and the defense did well in holding the vaunted Pittsburgh running attack to just 89 yards on 34 carries. Bill Kenney, in his fourth career start, completed 14 of 26 passes for 242 yards with two touchdowns while tossing one interception. Henry Marshall caught 4 passes for 89 yards and a TD. Ted McKnight led the rushers with 59 yards on 17 carries that included a score, and promising rookie RB Joe Delaney gained 43 yards on 9 attempts while FB James Hadnot contributed 8 runs for 42 yards. For the Steelers, Terry Bradshaw was successful on 21 of 36 throws for 319 yards with two TDs but also two interceptions. John Stallworth caught 6 passes for 107 yards and Jim Smith gained 84 yards and scored a touchdown on his 4 receptions. Franco Harris ran for 70 yards and two TDs on 19 carries. “What could have been a great win, even with all the mistakes, ended up being a lousy loss with a lot of mistakes,” said a disappointed Terry Bradshaw. It was a sign of better things to come for the Chiefs, who won eight of their first 12 games before sustaining three losses in the last four to end up at 9-7 and third in the AFC West. Pittsburgh continued to struggle, going 8-8 to place second in the AFC Central and out of the playoffs for a second year. Bill Kenney saw most of the action at quarterback for Kansas City (although Steve Fuller regained the job late in the season) and had a fair year, throwing for 1983 yards with 9 touchdowns and 16 interceptions. Joe Delaney broke out as a Pro Bowl player, running for 1121 yards while averaging 4.8 yards per carry. It was still defense carrying the club as Art Still, Gary Barbaro, and CB Gary Green also were selected to the Pro Bowl, along with Nick Lowery, whose three field goals against the Steelers were the first of an eventual 26 out of 36 attempts. 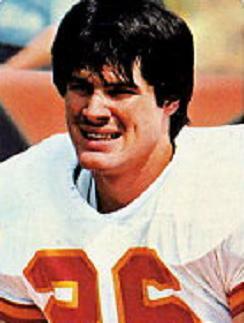 David Trout, who missed his first two extra point attempts, ended up missing a total of eight of his 46 tries during the season. He was 12 for 17 on field goal attempts and lasted the year, but was not back in ’82. He would resurface in the USFL with better results.